Whether you are a skilled finish carpenter or a novice woodworker, there are free desk plans to fit your pocketbook and skill level. There are many styles perfect for a beginner, such as a desk made from a recycled door. Use simple tools and basic skills to construct a desk from a single sheet of plywood. Wall mounted desks can be customized to fit any space and are great beginner projects. An advanced woodworker will find free desk plans for classic rolltop desks and classic kneehole designs. Routed drawers and stylish handles, knobs and hinges add a designer touch to any desk. Select clear pine and finish with stain or paint, or choose beautiful hardwoods to create a future heirloom desk the family will use for years. Also visit the Computer Desk Page for more desk plans. 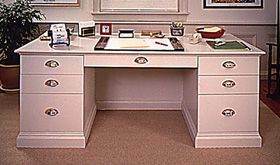 Instructions for building a spacious and attractive office desk that has six side drawers for tons of storage. Expensive office desks at the store may not always fit, but you can easily make a one size fits all office desk with these easy to follow instructions. 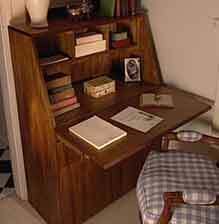 Build this writing bureau desk that looks good in most any room and the top can fold up to keep papers and other items out of sight. You can build your own home office with desktop, work area, lots of drawers, bookshelves and more; this home office has it all. 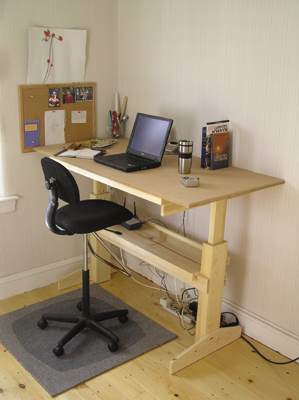 A project for an adjustable office desk that is a cinch to build and costs approximately $150.00 to build. 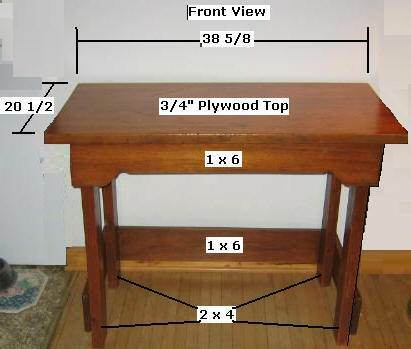 This is a great desk for drawing, drafting and writing and is very quick and easy to build. Build a roll top desk that is somewhat smaller than the standard roll top. 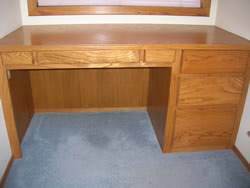 This desk has lots of needed storage and a spacious desk top. This lovely desk has a glass top and the wooden support is in Greek Key styling. Beautiful piece for most any room. Build this large, strong and sturdy desk that works great for students young and old alike. 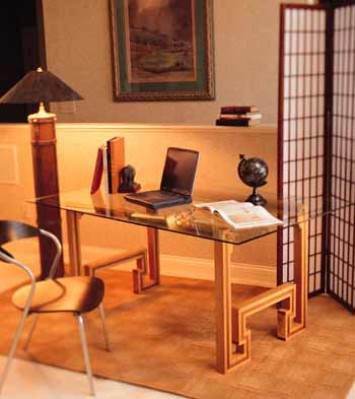 When space is tight you may want to create a desk from a door that is easy to knock down and store away. Here are plans for a built-in desk with 3 large drawers on one side and 3 top drawers for storing office supplies. This kneehole desk has Early American styling and looks good in a den, bedroom or even a college dorm room.